Women and men with sleep apnea exhibit different characteristics and face different challenges. That’s why we created the AirSense™ 10 AutoSet™ for Her – the first sleep apnea therapy device designed to provide female-specific therapy. 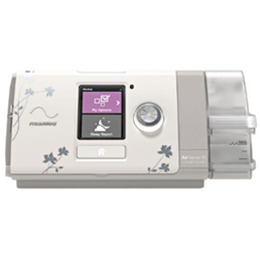 Combined with stylish ResMed for Her masks, the AirSense 10 AutoSet for Her machine delivers a complete sleep therapy solution tailored for women. This self-adjusting device also has an integrated humidifier and the optional ClimateLineAir™ heated tube designed to optimize your comfort.